While all the well-known popular ultra runners have been training and preparing for the highly hyped UTMB race, I have been recovering from BR100 and getting ready for another widely talked about ultra, UROC. UROC is a race I think I can do well in and maybe have an advantage over some of the "top" ultra guys since they are racing overseas less than a month before the race. It is also on some more formidable mountains, ones that I have more experience running on. With that, this is the first ultra I will be doing with, to me, not the type of training I would normally like to have going into a longer race. I get confidence from big mileage weeks and long runs and since BR100, I have did neither. It has been three weeks since BR100 and I have five weeks till UROC - I'm looking forward to see what I can piece together in these five weeks. 7/7 Sun - 0 Miles, Still feeling rough. 7/12 Fri - AM: 3 mi (23:00) PM: 10 mi (1:00:30) SSU Alumni 5K - 16:22. Went out and ran my hardest and this is what I got. Was 2x defending champion but got 9th this time around. Would have liked to see what I could have ran without a 100 miler 13 days prior. 7/15 Mon - AM: 12 mi (1:30:00) Hangover 5 Mi. Time Trial - 30:22. Had to rejoin the Bears with this familiar tradition and surprised myself with my third fastest time on the course. I have started to get back into a rhythm with my running. Daily and weekly mileage is going up but I am still not feeling as fresh as I was before BR100. The past few days have been refreshing though as my legs are finally getting that feeling that they can just keep going as long as I wished for them to go. It is the time of year for colleges to start again and this is the first time since I was four years old that I am not preparing to go back to school. It is also the first time in quite a while that I will not have daily practices, weekly meets, and all the other types of functions that I grew used too. I am not working a solid job which I had hoped to get after college and my mind really does not know what to do. When I do not have a constant flow to my day I get bored and when I get bored I end up getting lazy. Took me by surprise, college ending. The day started early at 3:15 a.m. when I was eating my breakfast of blueberry bagels with Nutella - I had practically jumped into my running shorts after getting out of bed and was looking forward to the next 20 hours, or hopefully less. 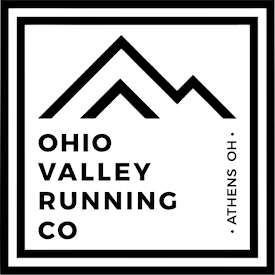 I knew 2011 was going to be the year for my first 100 mile race and Burning River was on my radar for apparent reason - it is in Ohio, the course resembles a lot of the type of running I do in Southern Ohio, and it is the USATF National Championship. Although I knew I was running it for quite some time, probably 3 months before the race, I held off on registering until the Tuesday before the race. Signing up late meant spending a little more money on the registration but I didn't want to run my first 100 without being prepared as well as I needed to be - so I waited until I felt comfortable with it. Before I get on to the race, I want to post the six weeks of training leading up to the race - I was lacking updates on this blog for the past few months. For my complete and day-to-day updated training log, you can always visit Running2win. 6/22 Wed - AM: 10 mi (1:15:45) Garden of the Gods. PM: 3 mi (27:20) Hoosier Pass at 12,000 ft.
6/23 Thur - AM: 10 mi (2:45:00) Hoosier Pass, sucking air and walking at 13,000 ft.
At 5 a.m. a crowd of about 280 runners gathered in the field at Squires Castle to begin a long day of running through a network of trails and roads in Northeast Ohio for the 5th Annual Burning River 100 - this was also the 2011 USATF 100 Mile Trail Championship. I was anxiously awaiting my 100 debut to start. We started through the field and quickly jumped onto River Rd. for nearly 10 miles of hard asphalt running - this predictably made for the fastest section of the entire day, but surprisingly quicker than most of us imagined. 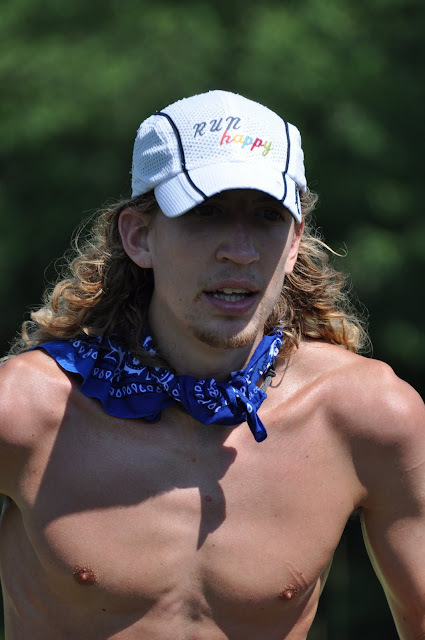 David James, who I had not known before the race, quickly was out of my sight and I settled into a group of a few other runners, Eric Grossman, Jordan Whitlock, and Jay Aldous. We arrived at the Polo Fields aid station (9.6 mi) in a quick time of 1:09:00, 7:11 pace. Dave was already a couple minutes ahead of us. From there, we entered trails and with muddy horse worn sections and small creek crossings the pace began to slow into an actual 100 mile pace - though the pace continued to slow all day long. By the Shadow Lake aid station (18.6 mi), Dave came back to us and there was a solid pack of four guys running in the front that continued until Station Rd. Bridge aid station one-third of the way through the race (33.3 mi.). At this point in the race I was still feeling fresh; I had not yet went over my longest training run distance and was at 4:18:00 - 7:45 pace. I was very surprised at the faster pace, but I knew the hillier sections were in the last half of the course. I made a quick stop to fill up my bottles and before I could get going, Dave James was already out. I would be chasing him the rest of the day. Eric stopped to change his shoes so I was now running second overall and by myself for the first time - Eric caught back up quickly though and things remained about the same for a good portion of the race, except that Dave was increasing his lead every aid station. At 43.8 miles he was 9 minutes ahead of us and then 14 minutes ahead at the first Boston Store aid station (49.1 mi). Eric and I coming into the Halloween spirited Ottawa Point (39.6 mi). It was nice running with Eric for basically the first 53 miles of the race. 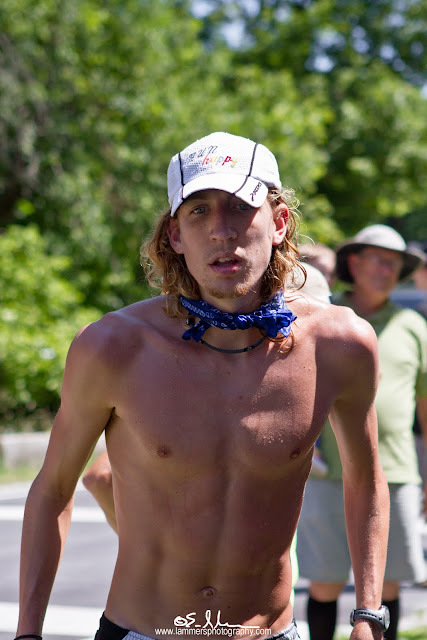 We kept a conversation the majority of the time and I learned a lot about ultra running from him, as he has been through this a bit more than I have. I think we were both a bit surprised to keep hearing Dave was increasing his lead by so much in a short period of time - I felt that we were running pretty hard. Compared to running short races, hearing that someone is 14 minutes ahead sounds like a lot of time to make up. 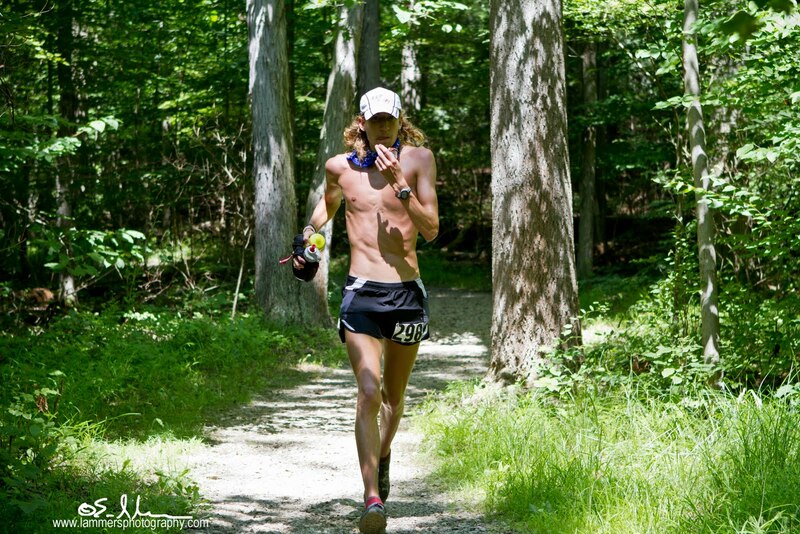 After leaving Boston Store 2, I passed Eric up a hill and kept increasing my lead. I found out later that he dropped out at around 70 miles. On the out and back section from Pine Lane (58.3), I saw Dave and he was looking pretty good, but had only increased his lead by one more minute. Seeing him gave me a little more motivation and I kept telling myself that I could still reel him in a little at a time. The section between Pine Lane and Happy Days (63.8) was a long stretch of road and then gravel/paved bike path and even though I dreaded these sections, I knew that I could use these as a positive to get my legs rolling and maybe pick up some ground. At Happy Days I was happy to hear that I had actually picked up a little time on the leader, albeit one minute. I also learned that I was 16 minutes ahead of 3rd place, Jay Aldous. At Pine Hollow 2 (73.9 mi) I was still making progress, now 13 minutes behind. I was working really hard for that one minute! Mentally, I was still in the game and I was confident that if I kept doing what I was doing I could keep closing the gap. Physically I was feeling alright as well. My stomach was not an issue, and although my legs were more sore than they had ever been, it was manageable. The next section to Covered Bridge 1 (80.5 mi) was a long 6.6 mile stretch of mostly trails and I made a concentrated effort to push harder than I had been in hopes that he would have a hard time on the longer than normal section without aid. When I came into the Covered Bridge I learned that I made up three more minutes and was now within 10 minutes of Dave! 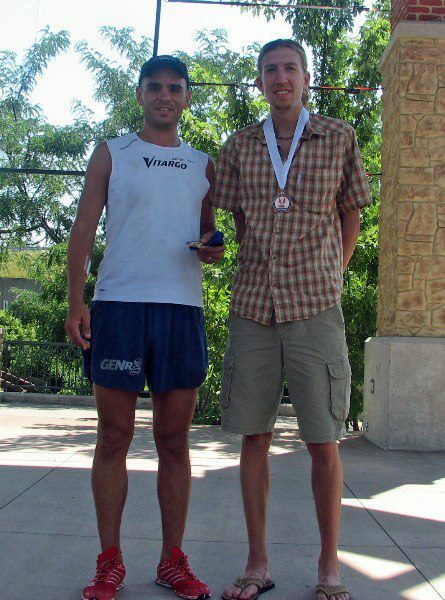 I was also 17 minutes ahead of Jay, who continued to stay consistent in third place. The wheels began to fall off in the next section... looking back, pushing hard from Pine Hollow to Covered Bridge probably took a lot out of me. The 4.7 mile section from Covered Bridge 1 to Covered Bridge 2 took over an hour and I lost 15 minutes to Dave. So after getting the lead down to 10 minutes, he had 25 minutes on me, just like that. My legs were shot and I was walking the uphills and downhills and barely jogging the flats. Mentally, I never considered dropping out - but I was worried that I was going to have to walk the last 20 miles of the race. I sat at the Covered Bridge 2 aid station for 9 minutes trying to refocus. The gracious volunteers and my crew (mom, dad, and grandpa) surely did a great job of getting me what I needed and back on my feet. As I was sitting there, I moved into 3rd place for the first time in 30 miles as Jay got in and out quickly. After getting going again I still had trouble running and walked the majority of the road section after Covered Bridge. I knew Mark Godale was coming on me and he finally caught me as we entered the trail going up to O'Neil Woods aid station (88.5 mi). Mark gave me a few words of motivation and I got into a rhythm and ran right behind him. Going back down the trail after O'Neil Woods, Mark stopped and I kept going and entered the towpath trail and ran to Merriman Rd. aid station (93 mi). Memorial Parkway aid station (96 miles). Putting the headlamp on for the last little trail section. After basically walking miles 80-87, I was running again and the 7 more miles to the finish was enough to keep me going. My last 13 miles were 9:05 pace, the fastest I had ran since 43 miles. I made my way into Cuyahoga Falls and finished in 3rd place with a final time of 16:26:00. 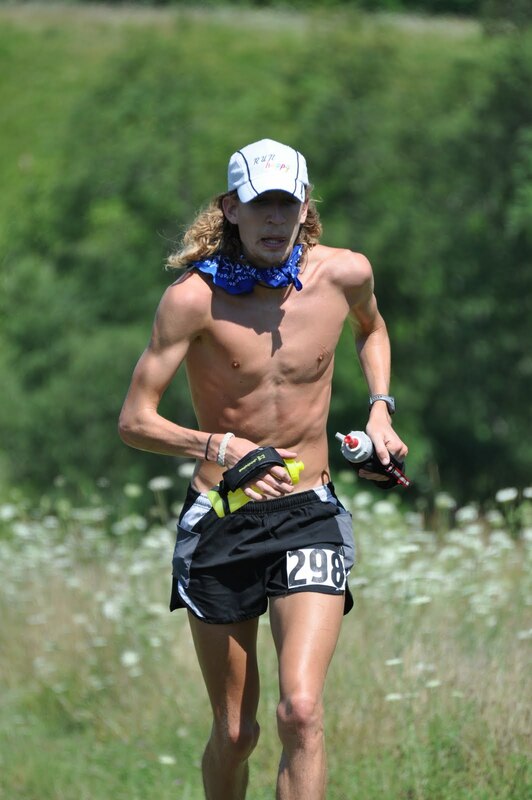 My first 100 mile race was all that I hoped it was going to be, and then some. I learned so much from doing this and have a lot of things I can take away that I liked and things that I will do differently. I was in the race to win it and even though I did not win, I went for it - maybe I went for it a little to hard, too early but I made a decision at 73 miles to go hard because at the time I was feeling good. I didn't want to waste moments that late in the race when I was feeling good. The beginning of the race started out fast. I didn't think there would be much running under 8 minute pace, let alone the first 35 miles. I did a 34 mile training run much slower than that. Fueling is what I felt I did best in this race; my stomach never gave me an issue. Don't ask me to eat another gel anytime soon though. One thing that I made certain of, thanks to Eric Grossman for an early reminder, was taking salt. S!Caps were what I used and they worked great. I used many different types of gels throughout the race, GU, PowerGel, and Hammer Gel. I ate a few packets of GU Chomps and Clif Bloks throughout the day as well. I did not have a plan, or calorie count per hour, or any real routine with what I was putting in me - I went off of feel and simply kept taking something every so often. I carried two bottles with me the entire race and could have probably carried only one in some sections. I had Gatorade in one and water in the other for the first third of the race and switched to just water the rest of the way. This seemed to work good for me. I ate a little salty snacks at some aid stations and remember vividly the refreshing watermelon at the Pine Hollow. Standing with the winner, Dave James. My crew of my family did a great job even if they don't have as much experience as some of the other runners crew. We all learned a lot from seeing what the other runners did in terms of preparation at aid stations. Mentally I stayed strong the majority of the race. The slow 7 mile section I had after Covered Bridge was my only lapse in staying focused. I probably could have ran through it, but it was the first time my legs was experience real resistance. I eventually got it under control and ran through it, but it took me a while to accept running through a little burn. I was also very impressed with the course. I was scared of reading about stories of even the best ultra runners taking wrong turns or getting off course from poorly marked sections. I hardly had to think twice on which way to go the entire day. Every turn was properly marked and no time was wasted in figuring out where I needed to go. Race Director Joe Jurczyk and all volunteers of the race did a fantastic job at making this a good experience for the runners.